Compositors and clerks [of the 'Times of India'], - 1890 Curwen, Kane & Co.
bl.uk > Online Gallery Home	> Online exhibitions	> Asia, Pacific and Africa Collections	> Compositors and clerks [of the 'Times of India'], - 1890 Curwen, Kane & Co. 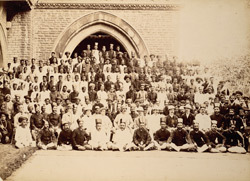 Formal group portrait by Shivashanker Narayen showing employees of the Times of India newspaper posed outside the School of Art at Mumbai, on the occasion of the departure of Mr Kane for England in May 1890. This print is from an album put together for the occasion of the newspaper's Diamond Jubilee (60 years) which was celebrated in November 1898. The newspaper was established in the 1830s following Lord Metcalfe's Act of 1835 which removed restrictions on the liberty of the Indian press. On the 3rd November 1838 the 'Bombay Times and Journal of Commerce' was launched in bi-weekly editions, on Saturdays and Wednesdays. It contained news of Europe, America and the sub-continent and was conveyed between India and Europe via regular steam ships. From 1850 the paper appeared in daily editions and in 1861 the 'Bombay Times' became the 'Times of India'. By the end of the 19th century the paper employed 800 people and had a wide circulation in India and Europe. The company was owned by Curwen, Kane & Co. at this time in 1890.